This is the month of solicitations for POLAR: NO MERCY FOR SISTER MARIA, the third and last compilation (expanded, corrected and dialogued) of my webcomic series. Every Polar volume is a self-contained story, so any of the three books are a good starting point. Read them in the order you prefer! Support the creator-owned series pre-ordering it! 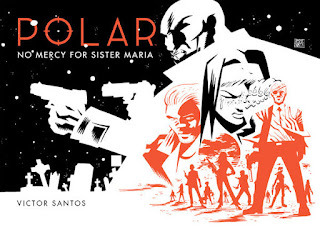 Este es el mes de los pedidos de POLAR: NO MERCY FOR SISTER MARIA, el tercer y último recopilatorio (expandido, corregido y dialogado) de mi webcómic. Cada libro de Polar es independiente y es una historia completa, así que te puedes engancharte a la serie con cualquier tomo.¡Léelos en el orden que prefieras! ¡Apoya a las series de creación propia reservándolo!